I arranged a day of fly fishing for mum's birthday for a group of 4 of us and had an absolutely amazing experience. Charley and Scott were so unbelievably patient and skilled with absolute cracking personalities to boot, I can honestly say I had one of the best days of my life. We had stunning views, a delicious lunch (and bubbles!) provided and a wee bit of four wheel driving to get us to the most amazing spot. 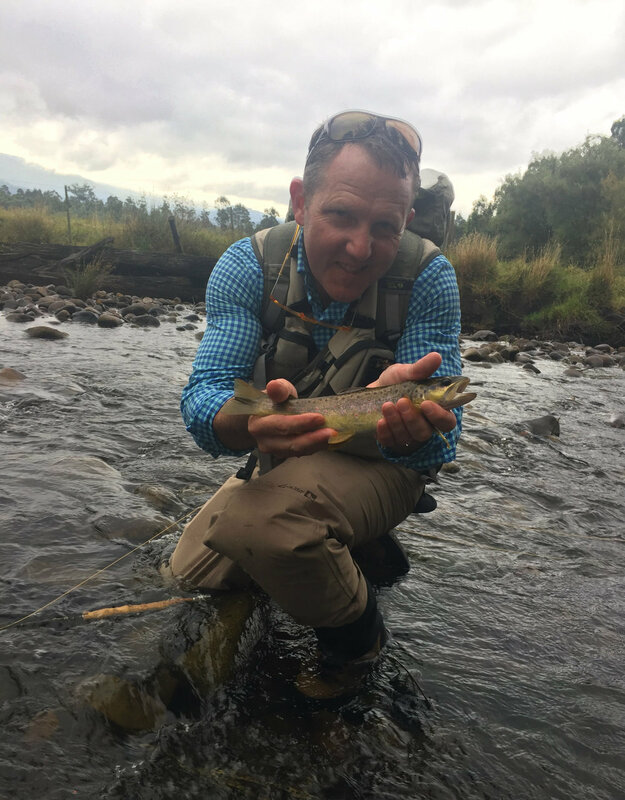 I was lucky enough to catch (and release) a rainbow trout but I can honestly say that the highlight was simply casting the line and making our way up the river. I'd definitely get a lesson from Charley again, if only for the serenity I seem to have found during our lesson. — Nicole McCabe. Melbourne, Australia. With limited time to fish during a trip to Australia for a family event, I had only one day with Charley out on the Steavenson and Little River - but what a wonderful day! She guides almost effortlessly and invisibly - whilst you hardly notice it, she is pointing out the runs, switching flies, thinking about the next run, putting you just where you should be. She knows the river like the back of her hand, and is prepared for anything (including the Tiger snake we encountered!). As a bonus, if it’s needed, she is an absolute delight to get to know and to spend the day with. You could not wish for a better companion any day, and certainly not for a day’s fishing. — Chris Pocock. London, UK. I’ve had few guides through the years, but Charley May was a special character who guided me in the Yarra Ranges. 1. Wonderful personality – which means one thing in certain circumstances, but for my guide it is essential. She offered pleasant suggestions when I realized in hindsight a more firm rebuff might have been appropriate. She adjusted pace to keep me happy. She has a wonderful and rich life experience that she is not hesitant to share. And she is comfortable with silence just when it is desired. 2. Excellent understanding of the way a river runs – the river was lower than normal conditions, but Charley continuously pointed to the runs, the pools, the counterintuitive posts that were taken up by the trout in the stream. 3. Good bug & fly sense – without exaggeration, there were 5 distinct moments when Charley had me change flies over runs we were actively fishing that resulted in hookups within 2 casts. Trust her. There is plenty more. I’ll be back. — Richard Wolf. New Jersey, USA. "Charley has grace, unbelievable patience, a world of knowledge, and a great sense of humour." I met Charley May before I became interested in fly fishing. We were pursuing another passion which is horses. While I’d vaguely considered trying fly fishing it was Charley who inspired me to take a lesson. She has grace, unbelievable patience, a world of knowledge and experience, a great sense of humour, an understanding that we have different learning abilities, and a smile that will knock your socks off. So far I’ve only had one lesson but planning on taking more in the future. It is so worth it! A super fun, learning and rewarding experience … and she packs a delicious lunch! — Carrie Aronson, Anglers Rest, Victoria. I've always wanted to try fly fishing and never knew where to start. Charley was a great teacher, I was chuffed to have a hang of the basics after a day. Can't wait to get on the water again next season. And she also packs a mean picnic. "Charley helped my daughter catch her first three wild trout." I wanted to provide an all in fly fishing experience for my daughter Hannah, so contacted Charley. We met at the legendary Marysville Bakery, a short drive led to the “spot on the river”. Charley’s snake charm removal spell worked really well, not one was seen. Despite the weather turning to crap, Charleys enthusiasm didn’t wane during the whole day. Her persistence and patience with Hannah paid off, with Hannah catching her first of 3 wild trout. I watched from the bank as she worked with Hannah, adjusting a cast, pointing out the spot to cast and being a great mentor during a hard day. As a slightly more experienced fly fisher even I benefitted from some of Charley’s words and direction. Overall the day was hard, but as we chatted on the drive home, both Hannah and I agreed it was a great experience. As a dad, it was all I could have wished for my daughter. — John Motyka, Melbourne, Victoria. I had the pleasure of going on a day trip with Charley recently with a friend who had never been fly fishing. I found the casting instruction to be the most thorough I had encountered and it certainly helped my friend get (somewhat) comfortable with the casting action quickly. Once on the river Charley was extraordinarily patient and pleasant to be around, providing great beginner tutelage to my buddy and more advanced tips for me. My friend was able to catch his first fish ever (on fly or otherwise) and I caught more and larger fish than I ever had on this river, which I have fished multiple times. A great experience and highly recommended to anyone of any skill level. I have already booked in a trip for next season. I've been a spinner fisher for awhile and was keen to throw a few fly lines in. Thanks Charley for the lesson, the day went so fast, even though there's so much to remember. You're very calm and patient! Hope to be back for more. I'd highly recommend Charley to any local or visitor to the region. She's generous with her knowledge and if you get just a bite of her infectious passion, you'll definitely be hooked. 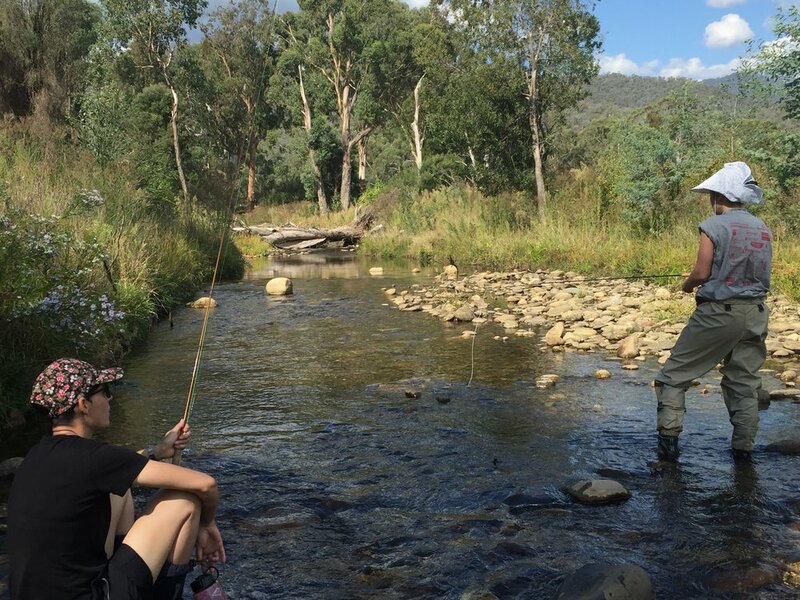 "Travelling fly fishers; do yourself a favour while in Melbourne, go fishing with Charley May." From the get-go, I felt at ease because Charley is very knowledgeable and a great communicator, giving tuition and pointers as we went. It was a tough day, drizzling at times, no sunshine and very little insect activity. So, for this old dry fly fisherman new skills had to be learnt on the go. I landed four little native browns, missed another three and got educated on the art of nymphing. It was a great day and the scenery was sensational. I am looking forward to my next visit to Melbourne and getting back out on the streams with Charley May. — Brad, Gold Coast, Australia.